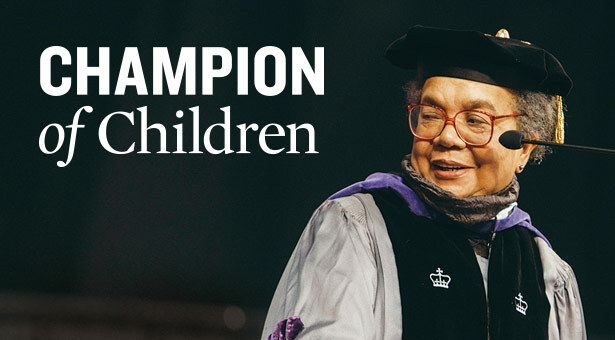 On June 14, Children’s Defense Fund President Marian Wright Edelman stepped to the dais at Key Arena to address Seattle Pacific University’s graduating Class of 2014. In a Commencement message rich with passion and conviction, Edelman, who is a Spelman College and Yale Law School graduate and the first black woman admitted to the Mississippi Bar, said that life is not about self-gratification or entitlement, but about service. In her parents, Arthur and Maggie Wright, she saw modeled a Christ-likeness that has informed every cause or issue she has championed since. When confronted with segregated playgrounds, her elders built kids a playground behind the church. Because no homes existed for aging blacks, her parents started one across the street from church. Her mother ran it and the entire family was required to help. “I learned everyone was my neighbor,” Edelman said. She and her four siblings quickly grasped that doing well in their world meant helping others and achieving in school. At 75, the best-selling author, former civil rights attorney, and recipient of the Presidential Medal of Freedom continues to work in the shadow of Capitol Hill. Unimpressed by position or power, she has engaged presidents and legislators, and lobbied doggedly in support of health care, early education, and increased aid for low-income families. 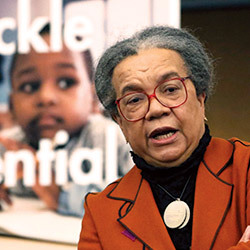 As part of the Children’s Defense Fund’s “Cradle to Prison Pipeline” campaign, Marian Wright Edelman speaks about how zero-tolerance school discipline policies can contribute to students dropping out of school. The CDF is one of the nation’s strongest voices for children and families. Its campaigns have helped to prevent child abuse and teen pregnancy. Its Freedom Schools provide enrichment programs that encourage a love of reading — and Washington State’s first Freedom School program was just launched this summer by Urban Impact, a Seattle-based ministry that has long partnered with Seattle Pacific University. Likewise, the CDF’s youth leadership and development training initiative is a model program much in sync with the Urban Youth Leadership Academy mission at SPU’s John Perkins Center for Reconciliation, Leadership Training, and Community Development. Both equip teenage servant leaders to influence their communities for good. Edelman’s work conveys a sense of urgency instilled in her by her teacher-preacher father. “Daddy taught that faith required action. He understood that it’s hard to be what you can’t see and always made sure we had windows to the bigger outside world. After her husband died, Edelman’s mother took in 12 foster children, and it is her parents’ strength that sustains Edelman in her life’s mission. It was not unusual, she says, to come home and find another child in her room or a pair of her shoes missing when someone had a need. “In my work at the Children’s Defense Fund, I do exactly what my parents did, just on a different scale,” Edelman says. What she gave SPU’s graduating Class of 2014 was a set of life principles for using that inflexibility to change the world. In her Commencement speech, Edelman talks about the “inflexibility” of forgiveness demonstrated by Seattle Pacific students in the campus tragedy the week before, and the indispensable role of service in a life well-lived.